PISat (PESIT Imaging Satellite) is an Indian earth observation nanosat built by the Crucible of Research and Innovation Laboratory of PESIT (PES Institute of Technology), Bangalore. 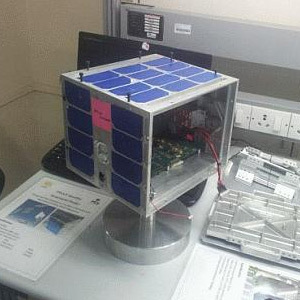 PISat is a 5.3 kg nanosatellite measuring 25.4 cm × 25.6 cm × 18.1 cm. It is equipped with a NanoCam, a CMOS color camera for Earth observation experimentation manufactured by GomSpace of Aalborg, Denmark as an imaging instrument to capture imagery of Earth's surface with a resolution of ~80 meters. PISat was launched piggy back into low Earth on a PSLV rocket.